Despite a growing green movement and new strict laws put in place aimed at improving air quality, sixty percent of Americans live in areas with unhealthy air pollution levels. Hawaii is fortunate enough to be located in a region that is not hit with over populated city pollutants, unlike my hometown. I live right outside New York City, a city consumed by truck exhaust and smoke plumes. When I stepped off the plane at Kona Airport, the air quality difference was tremendous. New York City is known for many things, but having clean air is definitely not one of them. 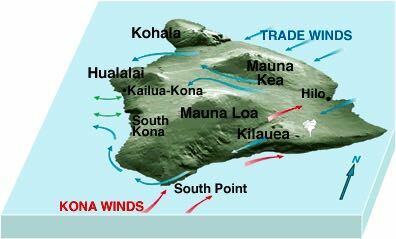 Trade winds play a critical role in determining the air quality in Hawaii. These winds, which blow from NE to ENE, allow the air to come to Hawaii uncontaminated due to the lack of air pollutants in the middle of the Pacific Ocean. Trade winds are not present in the smog filled air of New York City. Hawaii air quality serves as a role model for cities such as New York City. The population density in the city is a direct connection to the environmental threats that are present. The mass amount of public transportation for the millions of people in the city has grown to be the biggest factor in the contaminated air. Buses, taxis, and cars fill the streets of New York City while emitting air pollution that is severely damaging to the health of all 8.5 million residents. They release a wide variety of chemicals into the atmosphere when they are burned into the fossil fuels we use every day. We breathe air to live and what we breathe has a direct impact on our health. Breathing contaminated air puts you at a higher risk for asthma, other respiratory diseases and given that air pollutants are mostly carcinogens, it also puts you at risk for cancer. Being that air quality is critical to the health of all people, it is vital we come together to help end the growing destruction before it is too late. The irreversible effects that air pollutants can have on your health is not worth the risk that automobiles give. It is easy to help decrease the mass amount of contaminants found in the air. An easy and effective way to eliminate the air pollutants released in the air is by decreasing the amount of vehicles on the road. People can limit driving by carpooling, using public transportation, biking and walking. This does not only apply to New York City, but in fact everywhere. In effort to decrease the significant risks for human health and the environment that air pollution causes, I will be volunteering with CoolRoofs, a non profit organization that works to install energy-saving reflective rooftops. On September 29th, 2017, CoolRoofs is having a volunteer paint day where anyone in NYC can go and help contribute to their effort that I will be joining. The program, which launched in 2009, provides the free roof upgrades to nonprofits, affordable housing buildings, hospitals and select cultural and public properties. Buildings with the reflective paint can lower internal temperatures by 30% and decrease air conditioning costs by 10% to 30%. So far, CoolRoofs has painted 6.7 million square feet of rooftops across the five boroughs. The program supports the City’s goal to reduce carbon emissions 80% by 2050. Air pollution is not just an important environmental issue, it is also a public health issue. It is critical that we all take action to help eliminate the growing issues that air pollutants cause before it is too late.